Congratulations to The Villages® community in Florida for winning this year's most popular community award. Every year, 55places.com unveils its list of the 100 most popular active adult communities across the U.S. These 55+ communities earned their spot on our prestigious list based on the number of unique pageviews from visitors on each community’s page on 55places.com over the last calendar year. Read about the top ten communities that made the list followed by a list of communities rounding out the top 100 below. For the fifth year in a row, The Villages® takes the number one spot on our list of most popular active adult communities, which should come as no surprise considering this massive 56,000-home development offers 48 recreation centers, 35 golf courses, more than 50 swimming pools, as well as on-site restaurants, banks, retail shops, and town centers. The Villages® continues to be the largest 55+ community in the world, encompassing three zip codes, three counties, and over 20,000 acres of land. With numerous amenities and endless opportunities for social recreation, The Villages® is a distinct active adult development that truly has everything retirees could want or need. On Top of the World is another massive 55+ community. This Central Florida community will offer 10,000 homes upon completion and currently features an impressive collection of home designs as well as world-class amenities. Since opening in 1991, On Top of the World has organized over 200 clubs and special interest groups that cater to nearly every interest and features several clubhouses and numerous outdoor recreational facilities that enhance the active adult lifestyle within an attractive setting. Del Webb’s age-restricted community offers world-class amenities and quality built homes that combine Southern charm with a resort-style environment. The community boasts more than 8,000 homes, making it the largest active adult community in South Carolina, and also provides a 45-acre town center and amenity complex. 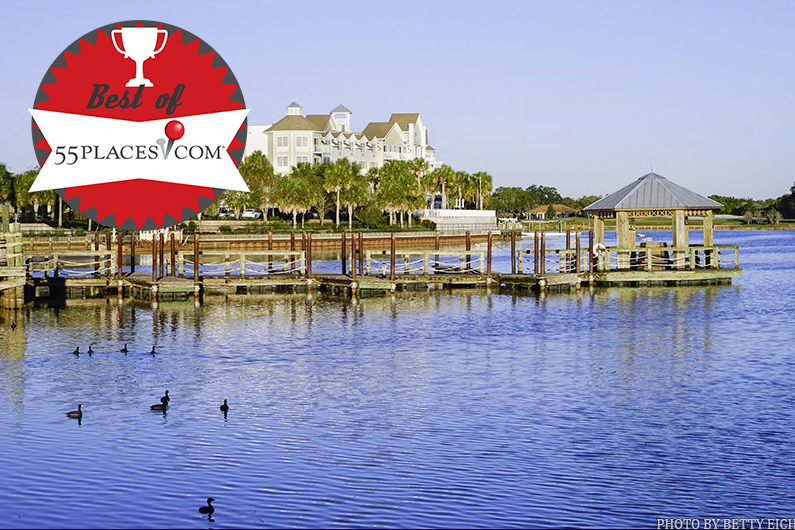 Ideally situated just 13 miles west of the popular Hilton Head Island, Sun City Hilton Head is a prime retirement destination for retirees looking for a beautiful semi-tropical, low country vibe in South Carolina. Since opening in 1961, Sun City Center in the Tampa Bay Area has remained a popular active adult community. It offers retirees a robust line-up of resort-style amenities and social activities as well as a variety of new and resale homes that will meet almost anyone’s style, taste, and budget. Today, more than 11,000 residents call Sun City Center home and the community will have more than 9,000 homes at build out. This self-contained community provides residents with on-site conveniences such as retail shops, grocery stores, worship centers, and a hospital. Sun City Center’s golf-cart friendly streets also make it easy for homeowners to get around the development easily. Making a second appearance on the top ten list since first appearing last year, Holiday City at Berkeley is the most popular community in New Jersey. It hosts more than 10,000 homes and provides retirees with an enviable line-up of amenities that keep them socially engaged and physically active throughout the year. Holiday City at Berkeley is the largest 55+ community in New Jersey and is made up of distinct neighborhoods within the development. Residents enjoy a low-maintenance lifestyle as well as six clubhouses and a long list of activities for an exciting active adult environment. Sun City was the first age-restricted community in the country and continues to be one of the most popular to this day. Sun City in Arizona offers Baby Boomers a wide selection of home designs with low-maintenance exteriors built by renowned developer Del Webb. In addition to beautiful homes, residents of this impressive active adult community enjoy numerous indoor and outdoor amenities as well as a vibrant social environment. Retaining a spot on the top ten list is Sun City Huntley in Northern Illinois. This 55-plus community offers retirees a tranquil setting that’s paired with countless amenities and activities. This Midwest retirement destination also provides residents easy access to downtown Chicago, making it convenient for homeowners to enjoy the attractions and entertainment options that the big city has to offer, yet far enough to leave the daily hustle and bustle behind. Solivita is an award-winning active adult community being developed by AV Homes that’s spread across 4,300 acres of scenic landscape. The builder plans to offer 5,900 homes at completion and homebuyers can choose from a wide selection of innovative home designs that come in different styles and sizes. In addition to an impressive collection of home designs, residents also enjoy an assortment of amenity centers, two 18-hole golf courses, and a rich line-up of social clubs and events. Solivita is located in a natural setting that offers scenic views of pristine lakes and wooded preserves that continue to attract retirees from across the country. Las Vegas’ Sun City Summerlin was Del Webb’s first active adult community in the city and boasts an impeccable line-up of amenities and recreational facilities. It features three golf courses, three restaurants, and four clubhouses as well as a long list of activities, clubs, and events. Sun City Summerlin was developed between 1989 and 1999 and has more than 7,700 homes. This 55+ community is located within the master-planned development of Summerlin and is comprised of 20 distinct residential villages. The community is spread across 22,500 acres that are woven together by more than 150 miles of trails and 100 neighborhood parks. Rounding out the top ten list is Laguna Woods Village in Southern California. Formerly known as Leisure World, this active adult community is the largest on the West Coast and boasts more than 12,700 homes. Residents enjoy superb amenities like seven clubhouses, five swimming pools, 36 holes of golf, and an equestrian center. Laguna Woods’ prime location also allows residents to enjoy the beautiful beaches of Orange County, which are just ten minutes away.